Many readers are no doubt aware that Shenzhen’s sister cities are all (more or less) boomtowns. Two of the most famous are Brisbane, Australia and Houston, Texas. Both Brisbane and Houston, like Shenzhen have seen major demographic changes over the past thirty years, both have also profited from restructuring to the global economy. 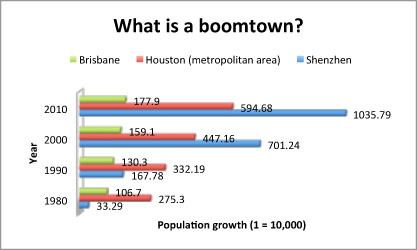 To get a sense of the scale of Shenzhen’s population boom, I created the following chart, which compares census statistics from Brisbane, Houston and Shenzhen from 1980 through 2010. And yes, for practical purposes I’m still using 1 = 10,000 to count. This entry was posted in noted, shenzhen elsewhere and tagged boomtown, brisbane, houston, population, shenzhen. Bookmark the permalink. Despite the huge numbers here in Shenzhen, China has one of the lowest levels of urban populace as a percentage of total population for developed/developing nations in the world. It’s going to be another 300 million into cities over the next 20 years or so.